SOLD.........SOLD.......SOLD.......WE SIMILAR CARS WITH SIMILAR PRICES !!!!!!! 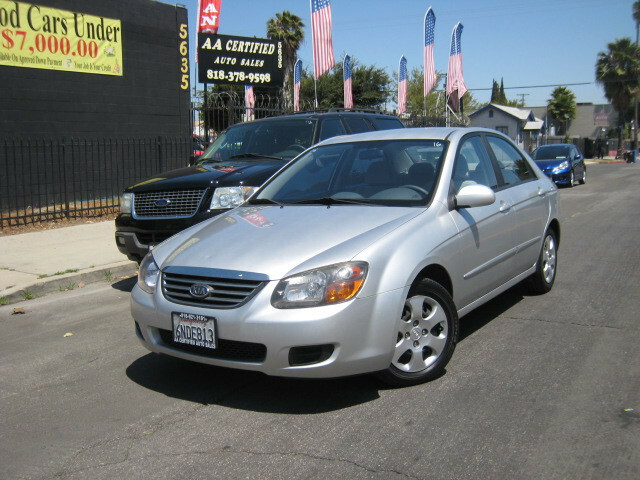 2009 Kia Spectra EX 4 Door, Automatic, Only 116K Miles, Silver Color with Gray Interior.............CLEAN CAR WITH CLEAN CARFAX................Loaded With Power windows; Power door Locks; Tilt Steering Wheel; AM/FM audio With CD/MP3 Player With Auxiliary Jack; Rear defroster and much more!!!!!!!!! !.............Kia Spectra Is Very Reliable, Economical Car, Easy On Gas And Low Cost Maintenance And Up Front Cost Is Budget Friendly, Perfect For Every Day Used And Commute..........Call Us Now to Schedule a Test Drive (818) 821-3181 OR Come See Us In Person at 5635 Tujunga Ave. North Hollywood CA. 91601...............Vehicle History Available ..........!!!!!!! !..We Take Bank Card, Cashier Check, And Cash For Payment, !!!!!!!!!!!!!!!!!!!! !WE HAVE MORE LOW MILEAGE AFFORDABLE CARS IN STOCK TO CHOOSE FROM. Visit AA Certified Auto Sales online at www.aacertifiedautosales.com to see more pictures of this vehicle or call us at 818-821-3181 today to schedule your test drive. Price excludes government fees and taxes, any finance charges, any dealer document preparation charge, vehicle preparation charge and any emission testing charge. Prices advertised are based upon a payment of cash, cashiers check, or debit ATM. Credit cards are accepted with a transaction fee. Financing terms carry current KBB Retail Blue Book Value for vehicle base price. Prices subject to change without notice. Not responsible for any typographical errors.Vehicles may be subject to prior sale. Included warranties may be offered by This dealership or by a third party company. Warranties may be limited and subject to a deductible. Some vehicles might have been a rental vehicle or have had prior accidents. we will provide you with an NMVTIS or a history report disclosure to view the history of the vehicle.